Being crafty has its perks when it comes to gift giving. I have a sick obsession with gift basket making, but it totally comes in handy when I can’t find the perfect gift for someone. 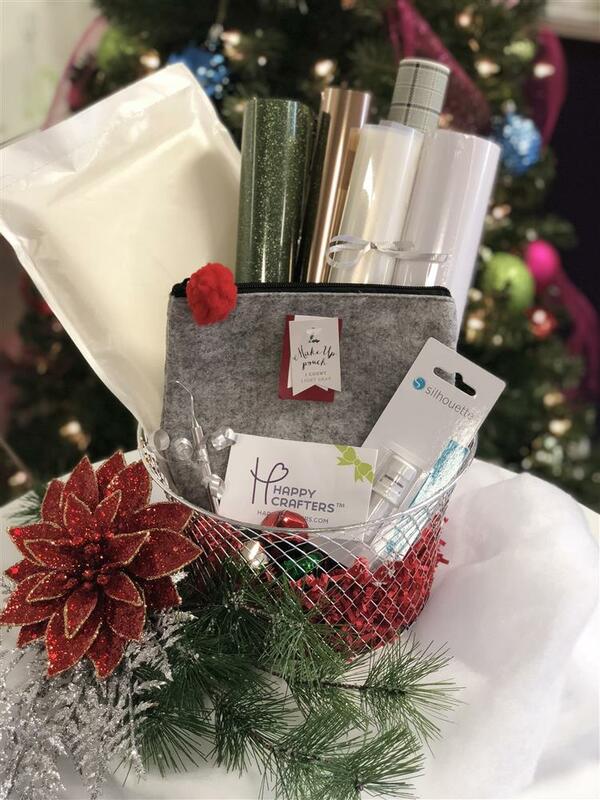 A gift basket allows you to be creative & make something pretty while also giving a gift with variety and purpose. I think that’s important. I decided to throw together a few examples of some gift baskets that you could make for a fellow crafter or maybe print photos of to hang on your fridge for your own wish list. Good idea, right? 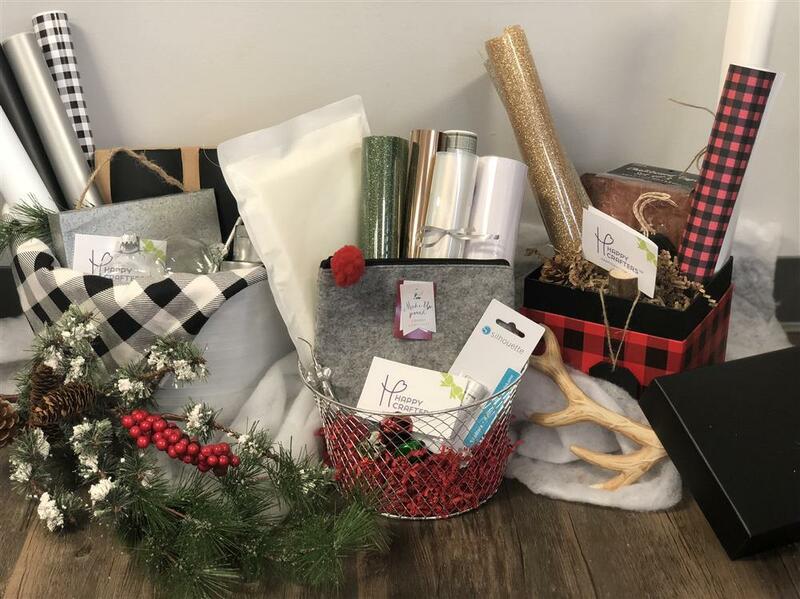 HTV Buffalo Plaid Gift Box – This one is pretty simple. It’s adorable, doesn’t need wrapped up, and has some pretty great essentials in it! Reusable Cover Sheet – Everyone that uses heat transfer vinyl should own one. It keeps your vinyl protected while heat pressing or ironing. Tie a bow around it after rolling it up for a cute presentation. Buffalo Plaid Printed HTV – No one can ever have enough of this. Don’t forget the mask! Roll the two together and tie some twine around in a bow or use some festive matching Washi tape to hold it. Siser Glitter HTV sheets – We used a sheet of the new Champagne color (LOVE it) and a sheet of Old Gold. What a perfect way to add sparkle to the box! 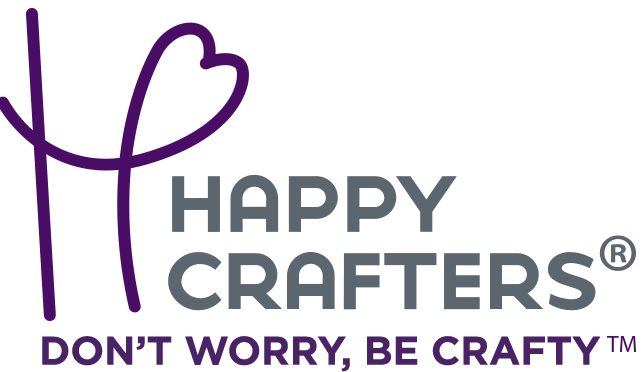 Happy Crafters Gift Card –Enough said, right? Be sure to use our printable gift card and holder if you are giving it in person and not just via email. Blanks – We use this little bag of chalkboard tags since they matched and added a cute touch but you can use anything, really. A rolled up T-shirt with some ribbon would be cute too! HTV Variety Gift Basket- Who wouldn’t be thrilled with this as a Christmas gift? You can use your craftiness to create different color schemes or styles. Heat Transfer Pillow- I used a 6x8 heat press pillow in this basket since it’s a little smaller. Pillows are great accessories for pressing onesies or items with heavy seams, zippers, or buttons. Silhouette Auto Blade- An extra blade is something any of us can always use, plus it’s a cute filler. Blank Make Up Pouch – Target dollar bins for the win! How adorable is the little blank felt makeup bag? Siser Glitter Sheet – Roll up a sheet of Glitter HTV in the color of your choice. We used Dark Green for ours. 2 Step Foil and Adhesive – Some crafters haven’t started their obsession with this yet, so why not give them a jump start on it. It’s so much fun to use! We included a roll of Rose Gold in this basket and a sheet of 12”x36” Siser Adhesive. Pattern HTV and Mask- We rolled a sheet of our new Festive Flannel HTV with a sheet of HTV Mask inside of it. Weeding Tool – Can we ever have enough of these, seriously? This is a really well made metal weeder also. 12” x 15’ Roll of Siser Easyweed – White HTV will NEVER go to waste. We added a full 5 yard roll of this to the basket to add value, but any crafter would be happy with this one of it’s own even! Adhesive Vinyl Gift Basket- I think this is my favorite. We used a piece of black and white buffalo plaid fabric to line the bottom of an inexpensive plastic tote (which doubles as a blank and the basket) and filled it with goodies. 2 Pack of Black Tumblers – Target dollar bin yet again. I love the matte finish on these. 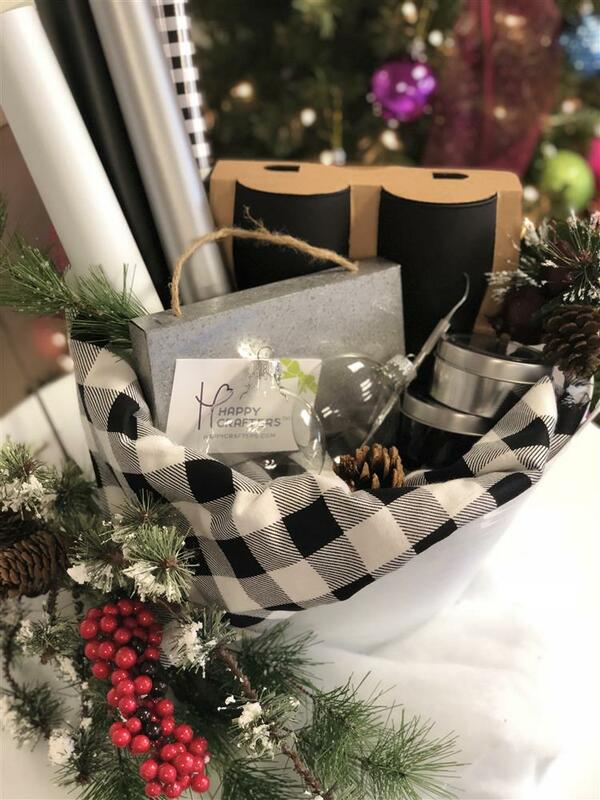 OraCal 631 Sheets- I rolled a sheet of Black, White, Metallic Silver for this gift basket since they matched but are also useful colors. Blank Magnetic Tins – I’m not sure where we picked these up actually but they are just an extra blank that fits well in this arrangement. Adhesive Pattern Vinyl Sheet- A sheet of matching Black and White buffalo plaid was obviously needed here. We have tons of different patterns in both heat transfer and adhesive so pick the ones you love most or that match the best for your basket! Weeding Tool – We stuck one in this basket too. Tie some ribbon around it to make it more noticeable if you want. Blank Glass Ornaments – Hobby Lobby find here. We just added 2 (mostly because we wanted to keep the rest for ourselves). Blank Galvanized Sign – You guessed it, another Hobby Lobby blank here. 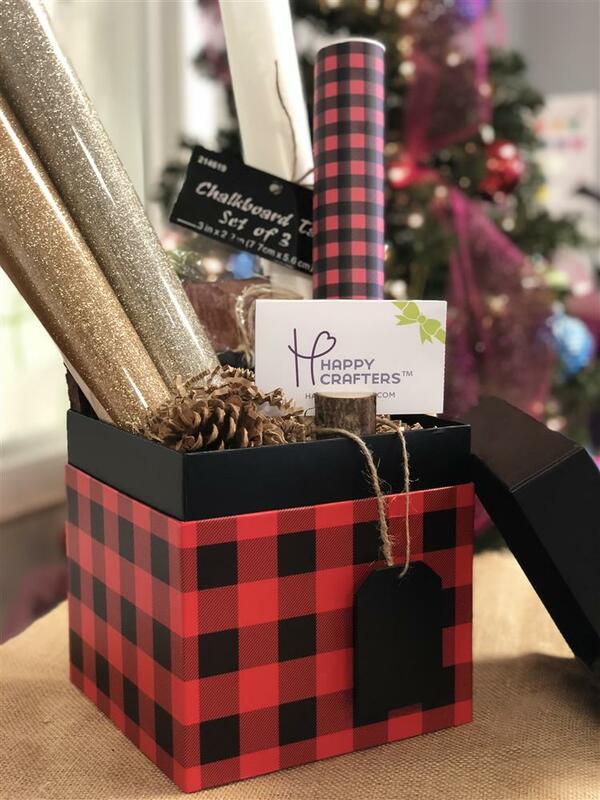 Happy Crafters Gift Card – We love the way these add value and a cute touch to all of the baskets. If you aren’t feeling adventurous enough to make a gift to put the gift card in, just take advantage of our printable Gift Card holder and give it as a solo gift. I promise, no one would mind that. Are you inspired? I would love to see any gift ideas you come up with for a fellow crafter! Where on earth did you find that adorable Buffalo Plaid box that you used to put your assorted gifts in?